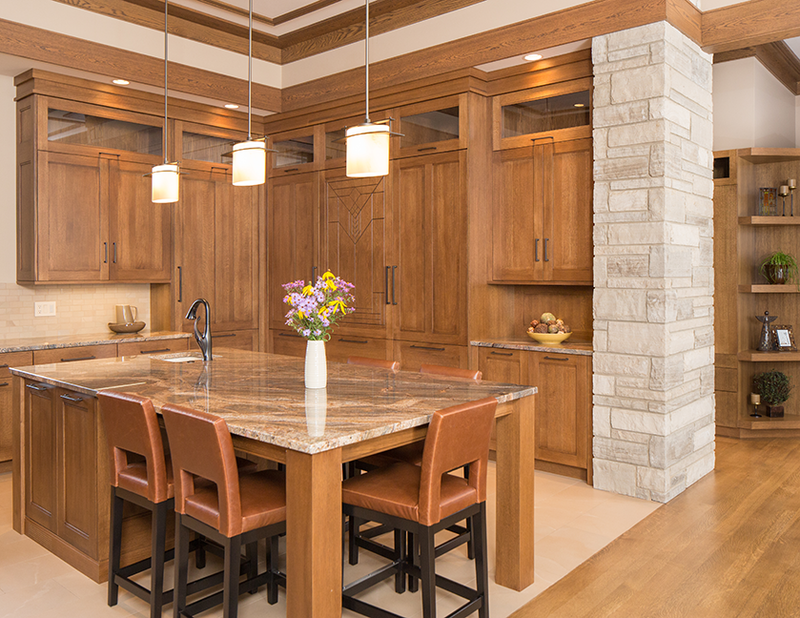 Designed and built with inspiration from past Frank Lloyd Wright projects, this new kitchen mixes elements of his designs from various projects. The design called for wood specie and colors to be consistent throughout the home. Keith Gegg of Gegg design & cabinetry kept the cabinetry simple but unique with a custom door based off a simple Shaker door with an added detail on the top and bottom rails. For a distinctive detail, a combination of wood-grain patterns of white oak were used. The door design uses quarter-sawn white oak for the center panels and rift (straight grain) white oak for the rails and stiles. The refrigerator and freezer are concealed in a wall of tall cabinets. The refrigerator panel features a Wright pattern used in his Tulip Window design. The homeowners have a reproduction stained-glass window of the same design in the foyer. Also in the corner of tall cabinets is an entry to the walk-in pantry that is concealed with a door that looks like the cabinetry with drawers below. When shut, it gives the kitchen a continuous simple look. 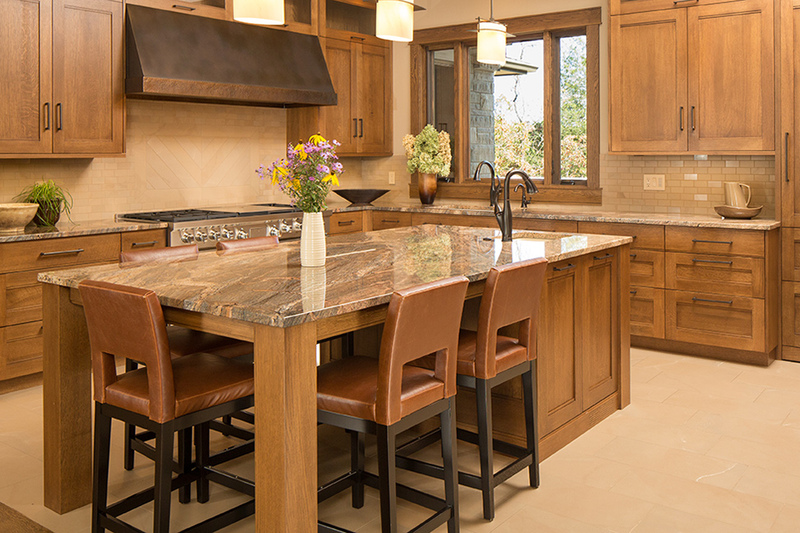 The solid-bronze custom hood has a unique patina created to blend with the cabinetry. This kitchen is so Frank Lloyd Wright. The use of oak is done well and not something you see in St. Louis. We love the built-in refrigerator and pantry, especially the pantry door that is flush with the cabinetry. The entire look is very custom. The touch of stone adds nice texture.